The Hamath is Caprice's answer to the common military requirement for an armored, all-terrain vehicle capable of moving troops across hazardous battlefield conditions and maybe even throw some firepower of it's own around. The Capricians used the same philosophy that saw much of their gear modified from exploration and engineering designs to support military needs. The resulting design, dubbed the Hamath, is a six-legged walker that can climb to keep up with the standard Caprician mounts and can carry a ten-man squad of Caprician infantry into battle. The Hamath model is an all-resin 1/144 scale model of this walker design and is similar to the other Caprice Mounts. We have a two-part article on assembling the standard mounts available as well: Part 1 and Part 2. This article is a brief review of assembling the resin model of a Hamath with some tips and tricks readers may find useful. Also, I am magnetizing the leg-torso joints of my Caprician mounts to aid storage and make them more poseable and will discuss that process as well. As with all model kits it is a good idea to open up the package and check for missing or damaged parts before beginning assembly. If there are any parts missing or damaged, please contact us and let us know! The Hamath is an all-resin kit which may be new to some modelers. In general, resin can be modified and worked much like metal, but it is a bit more fragile. 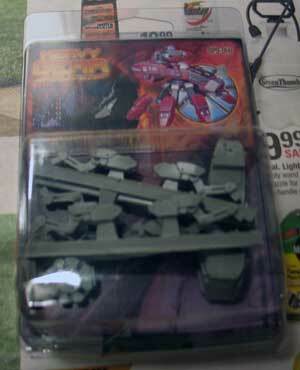 Be careful with thin parts such as gun barrels and antennae. There are many concerns in the gamer community about working with resin. Overall, it's a great material for both the manufacturers and the hobbyists. It's a lightweight, sturdy material and can be easily cut. For larger models it means that the model is lighter and shouldn't have issues with deforming under it's own weight like larger metals can. The resin material used is non-toxic. However, as a general safety concern inhaling small fragments of almost any material is not recommended and can potentially cause respiratory problems so it is recommended that any drilling, sanding, or other work on resin that may cause particles to become airborne be done outside or in a well-ventilated area with a dust mask. Resin can be glued using normal cyanoacrylate glues. It is also recommended to wash models with soapy water before priming. In checking my Hamath I discovered a small bit of pink mold material in the recesses on two of the legs. 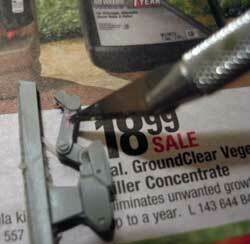 This can be seen in the image to the right at the tip of the hobby knife. If you find pieces like this in your model you will need to carefully remove the pieces. Good tools or this can range from a standard hobby knife to a dental pick-style sculpting tool (available in many hobby shops, art supply shops, and tool shops for working with small components). If you don't have something that can get into the space a needle, small screwdriver, or any thin, flat tool can be used to remove the excess material. The material is just excess rubber mold material and can be discarded. You will need to carefully remove the mold material. Try to avoid marking the resin unnecessarily. The pink color is just the material of the specific mold used and you may find other color mold materials in use. Mold tearing, like this, is unfortunately one reason molds for resin molds are only usable for a limited number of casts and must be replaced frequently. 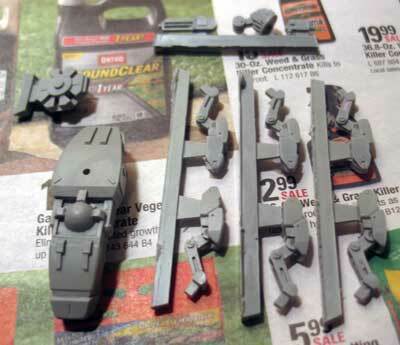 All parts will need to be removed from the resin sprues. This can be done with a hobby knife or clippers. Be aware that resin cuts more easily than metal. Go slow to prevent injury. In many cases parts can be carefully rolled off the sprues and require only minimal trimming. Make sure you don't remove any tabs such as the attachment tabs on the legs. As with the smaller mounts, the Hamath can be assembled as separate 'main hull' and 'legs' subassemblies that can then be joined together. I used the 'slow' version of Cyranoacrylate glue. This had the advantage that it was easier to tweak the model's pose as the glue cured to a state where the legs could still be repositioned, but wouldn't fall out of place. The bad side is that the slow glue needs much longer to set firmly, and handling the model in that time may lead to legs being misplaced. Note that the legs may change position slightly throughout the rest of this article. The legs fit into slots on the main leg junction piece. Attach the legs one-by-one and allow to dry as needed. The legs should go smoothly into the slot and the tab on the leg should be level with the base of the junction unless you're modeling the legs in mid-step. Leveling the legs is a big concern, and this is where the 'slow' CA glue is very useful. After I attached all of the legs, I could bend them as needed to make the Hamath sit level. 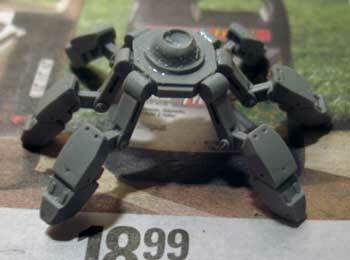 If I wasn't using slow-drying glue, I would probably recommend attaching legs in alternating pairs. Either way, go slowly and take your time. The leg pieces are identical so there's no need to worry about which leg goes in which slot. The Hamath doesn't have the 'cover plate' over the legs like the smaller Bashan mounts. If you're concerned that the legs might not be attached solidly, you could use thin plastic strips (available from most hobby and craft stores) to cover the leg connections. The main hull of the Hamath is a single piece. You'll need to add the weapons. 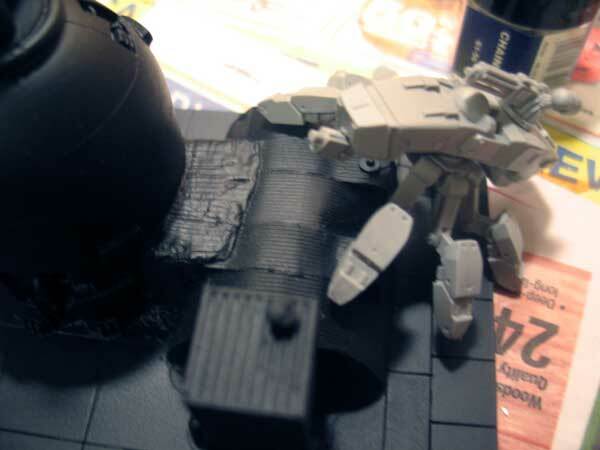 The top turret holds a Medium Autocannon and is built by attaching the Medium Autocannon piece to the turret mount. Once glued you can attach this to the main hull in several ways. The simplest is to just glue to down to the hull. You may also find that it can be set in the main hull without glue and will stay and rotate but you may lose the turret if the model gets knocked around. You can also set small magnets in the main hull hole and turret mount to keep the turret in place but make it easy to remove or turn. The other weapon on the Hamath is the chin-mounted Heavy Machine Gun. This is glued onto the main hull. As this and the main turret are on opposite sides of the hull you will likely need to let this piece dry before proceeding. I have found I like magnetizing my Mounts to make storing and transporting them easier. This step i, of course, completely optional. If you aren't interested in magnetizing your Hamath, you can either glue the hull and leg assembly together or drill a small matching hole int he two and glue a small piece of rod in one to act as a pivot point and allow gravity to keep the pieces together. No matter the solution you choose, I recommend making sure the legs are level and have dried before attaching the main hull to the leg assembly. Small rare-earth magnets are widely available on-line and may also be found at craft stores. I used roughly 3/16" diameter disk magnets. You'll also need a drill and appropriately-sized bits. I used a smaller hand-drill bit to place a pilot hole in the main hull's depression and the matching hemisphere on the Hamath's leg assembly. With this complete I used a 3/16" bit in a low-speed power drill to drill into the resin pieces to make a hole. A high-speed drill may go through the soft resin too quickly and will heat up the piece. I needed very little depth to fit the disk-shaped magnets. In fact, if you drill too deep you may want to place two magnets. You want the magnets placed so the magnet on each side can make contact with it's mate, but so the junction will not be noticeably raised. Note that if you're not doing a assembly article in which magnetization is a completely optional step, this can be done before assembly to make things easier. When planning magnetization, you do need to consider how the parts will assemble and swing around. Once the holes are drilled, the magnets can be placed. Before gluing the magnets in place, always check polarity! Magnets have a polarity or directional nature to the magnetic field. In short, most magnets have two sides which can be referred to as North and South. Magnets are attracted to opposite polarities, so a North polarity magnetic face will be attracted to a South polarity magnetic face and will repel other North polarities. What this means from a hobbyist perspective is you want to make sure you are consistent. I try to make sure all of my models are consistent and have matching polarity combinations to allow swapping hulls and legs if necessary. My Hamath is now complete! I will need to do a final check for any issues, then give it a brief wash in soapy water and allow it to dry before I can prime and paint it. I've got another Hamath to assemble for my Caprice Liberati force. The Hamath is an interesting model. Before the Caprice army was revised for Black Talon: Return to Cat's Eye the forces of Caprice were mostly limited to ungainly 'bubble tire' vehicles originally intended for use by prospectors and migrant workers. The creation of the Hamath gave the forces of Caprice a very unique APC that seamlessy meshes with the Moab and new Mount designs and is very different from the Terra Novan wheeled and tracked designs or the CEF's hover APC. it retains the essential flavor of Caprice as requiring vehicles that can scale canyon walls and navigate rock-strewn fields. The Hamath is a surprisingly powerful unit for an APC. It's got better armor than many Gears and all but the heavy support Mounts. It's speed and defense modifiers are comparable with the other Mounts it will commonly be deployed with. The armament is a Medium Autocannon for general support and a Heavy Machine Gun as an antipersonnel weapon. While not exceptional, this is a pretty powerful loadout for a support vehicle. It also has the Large Doors perk to allow it to unload it's cargo of troops easier and is currently the only vehicle with that trait other than the massive CEF HHT-90 hover tank. The Hamath is a great model for those who want to get some experience working with resin models and is a great addition to a Caprice force. The Hamath APC straight from the factory. The resin pieces included in a Hamath kit. Removing the excess molded material. 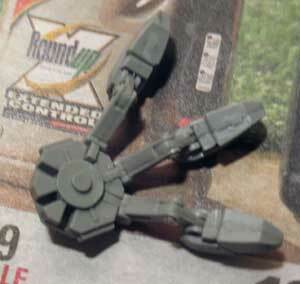 The Hamath's legs, including a hole drilled for magnetization. 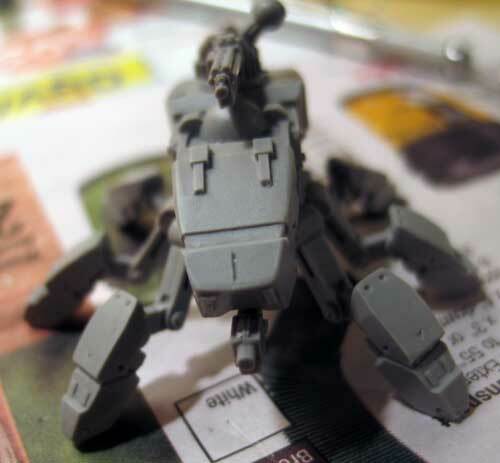 Three legs attached to the Hamath's hull. A Hammath attacking a Terra Novan structure.